A hypothetical group of people went out into a hypothetical field, and noted the following, in order to make a map of the field. The field looked a bit like this, and the corners, rather conveniently, came with the following "names". 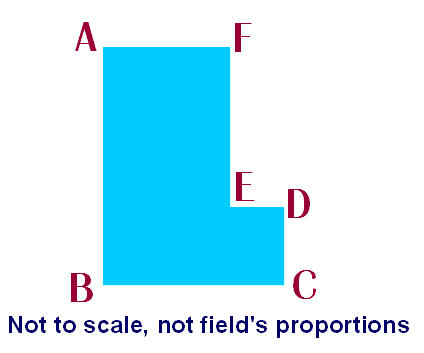 Once you have drawn all the lines implied by the angles above, you should get an 'L' shaped field. Don't worry if it isn't 'exactly' right.... just do what the numbers tell you to do! Now... if it were a perfect world, you would have a perfect map. But the world isn't perfect. Therefore, scientists and engineers look for ways to check their work, ways to spot errors, ways to make results more nearly perfect. You draw all three angles just right, the lines going towards F will all cross in the same place! By measuring more angles than they 'must', map makers collect information which will check the accuracy of the map they are drawing. Now.... have you really done what you should, according to the instructions above? There are two 'tricks' in this page's information which will help you see. When you are sure, sure, sure that you have done everything properly, click here to see what the 'tricks' were.